Chose the special Synagogue Triangle Private Tour, if you want to visit all three of the synagogues in the city centre and have the full experience doing it. With this 4 hour long tour, you can be sure that you will get all the information you would require about the Jewish aspects of Budapest. 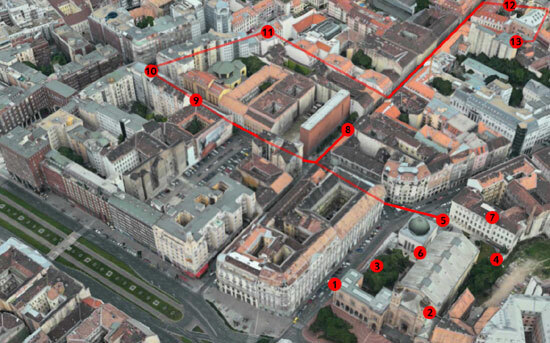 It includes visit to the Dohány Street Synagogue, the Rumbach Street Synagogue and the Kazinczy Street Synagogue. At the end of the tour, be our guest for a cake in a famous kosher confectionary, or receive 10% off at a Jewish restaurant! 1 – Jewish Museum with local guiding where you get acquainted with the Hungarian Jewish heritage through a unique collection of art pieces from Hungary and Eastern Europe, and the rich tradition of Judaism, its holidays and everyday life. A separate room commemorates the Holocaust in Hungary. 2 – Interior visit of the Dohány Street Synagogue which is the largest operating synagogue in Europe and the second largest in the world.